The 114th Congress just began on Tuesday and we have anotherdelusional thought emerge from the House Minority Leader, Nancy Pelosi. Apparently, the tail wants to wag the dog and doesn't realize who's running the show in the House. Yes, Nancy Pelosi has once again gone off the deep end of an admittedly shallow and diminished Democrat pool in the House. One has to give Rep. Nancy Pelosi (D-CA) credit for trying to push an anti-American agenda as the minority party in Congress. Only a liberal Democrat, with no business experience and a less than third grade understanding of taxation, could come up with such an idiotic proposal for a bill in Congress. American corporations are moving some or all their operations to foreign shores because the American tax code rate for corporations is the highest in the industrialized world. Liberals Democrats, with their idiotic tax code, have given corporations every incentive to move offshore with the highest corporate tax rate in the world driving them to do so. The economic principle is simple. The more you tax something, the less you get in return for your efforts. Understand that corporations are taxed on their profits at corporate rates and then stockholders are subsequently taxed at personal income tax rates again on the dividends they receive on the same corporate profits already taxed at the corporate level. This is exactly what the liberals want. Double taxation. They get two shots at taxing the same profits. Not a bad deal, when you can get it. Of course there is no moral or ethical justification for this, but then, we know liberals are morally and ethically challenged in doing anything that is morally or ethically right. That's just the joy of being a liberal. You get to make up a moral and ethical construction that suits the ultimate goal and, in this case, that is to squeeze and extract as much revenue as possible from corporations and tax payers. Back to the present. Liberal Democrats have driven American corporations to do exactly what they are doing for their stockholders, which, for corporations, is to maximize the value of the stockholder's equity holding in the corporation. Corporations have a fiduciary duty to bring the greatest value to the stockholders. Liberal Democrats simply can't get that concept through their Marxist socialist way of thinking. It's completely antithetical to Marxist socialist dogma. Liberal Democrats are captives of Marxist socialist dogma, which demands a redistribution of wealth from producers to those who consume the wealth created by others, while those consumers of wealth do little if anything to become part of the producer class in America. There are more people are on food stamps than are students attending all levels of education in America. America has become a nation of grifters living off the producers and why shouldn't they? Liberal Democrats have given them every incentive to live off the producers of America with the vast and wide ranging social welfare programs they have enacted into law in order to gain political control over these people. When liberal Democrat government provides the basic necessities for human existence, without any responsibility for those receiving the assistance, a perpetual underclass is created and this underclass, almost 50% of tax filers, does not pay personal federal income taxes and a good portion actually get rebates in excess of what taxes they had withheld by employers. The best possible outcome for America and its economy would be to completely eliminate the corporate tax altogether and shift the tax to the personal tax rates for individuals who receive dividends and capital gains from their corporate income. Individuals would receive significant increases in dividends which would make it more palatable to pay the personal tax rate. This will, however, never happen because politicians in general, and liberal Democrats in particular, will never willingly give up control of a source of tax revenue, even if it means it will increase overall revenues by eliminating the corporate tax. What makes Nancy Pelosi's proposal delusional is that there is no way on God's green earth, with an enlarged Republican majority in the House, that there is any chance of passing such Marxist socialist tripe. 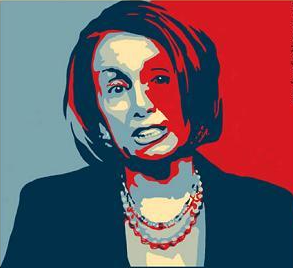 Could a liberal Democrat be anymore anti American than Nancy Pelosi? Probably not, but there are a lot of liberal Democrats that could compete for that ignominious distinction.